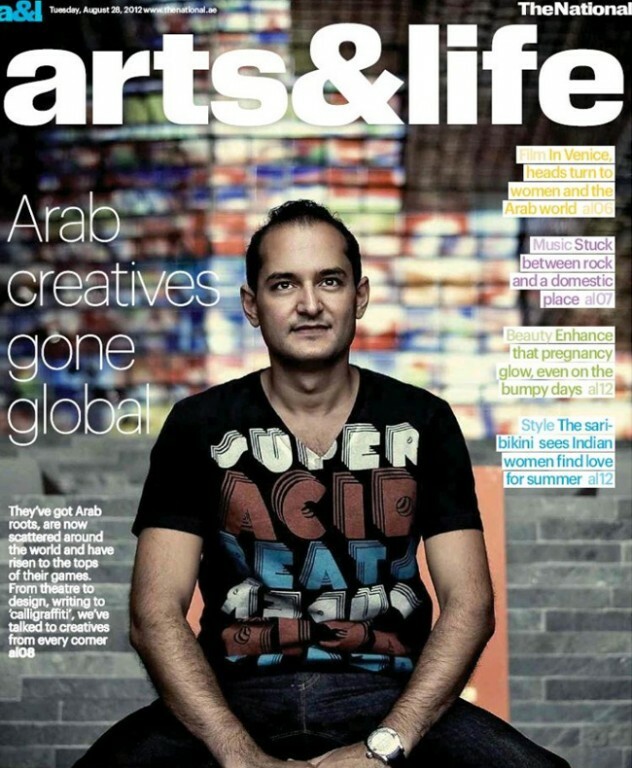 Tarek Atrissi featured on the front cover of the National newspaper; Arts & Life “Arab creatives gone global” feature. Dubai, United Arab Emirates, 2012.
International press and design press have regularly covered and featured our graphic work at Tarek Atrissi Design. Our designs have been published in countless design magazines, books and graphic design publications. TV documentaries and programs for channels such as BBC, MBC and Aljazeera have featured as well Tarek Atrissi Design. 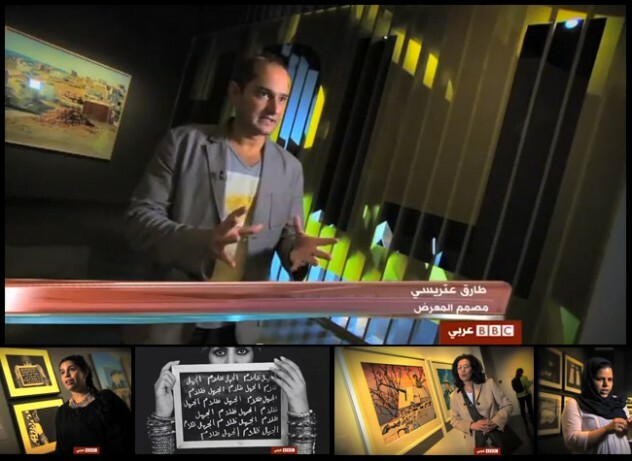 Above: Tarek Atrissi’s interview featured on BBC, during which he explained his design concept and process for the Light From the Middle East exhibition and 2D graphics at the V&A museum in London. – Featured in a TV interview on Al-Jazeera’s show “The Listening Post”, the media critique show at Al Jazeera English Television. August 2014. – Interview + work featured in “Agenda Culturel” French-Lebanese Magazine. April 2014. – Work featured + interview in the book “becoming a graphic designer: a guide to careers in design”. By Steven heller and Teresa Fernandes. 2014. 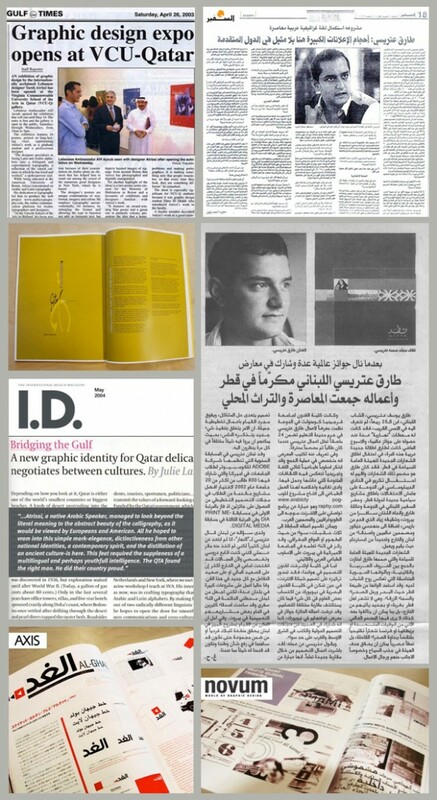 – Interview + work featured in Khaleejesque magazine, The Gulf’s lifestyle and culture magazine. August 2013. – Work featured + interview in the book “Design Firms Open for Business”, published by Allworth Press. June 2013. – Work featured in the book “Playing with type”- published by Rockport. February 2013. – Interview + work featured on Lioumness website- as part of the Harraga Bag Series. January 2013. – Cover feature on the Arts & life insert of the National Newspaper in Dubai, United Arab Emirates. August 2012. – Featured in the Lifestyle section of The National Newspaper, Dubai, United Arab Emirates. July 2012. – TV interview and feature on MBC television at the “Good Morning Arabia” TV show. May 2012. 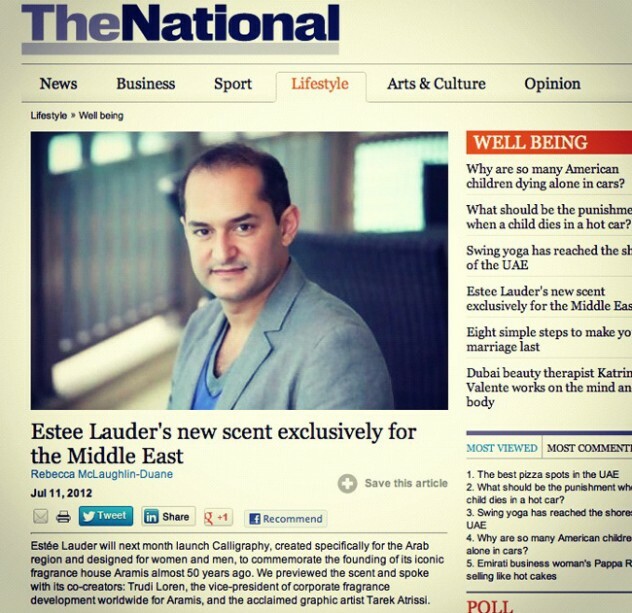 Above: Tarek Atrissi’s feature in The National Newspaper, Dubai, United Arab Emirates, 2012. – Interview + work featured in Arabesque 2, Published by Gestalten in Germany. November 2011. – Featured in “Fruit of the Forest” magazine: an international Design & Lifestyle magazine. September 2011. – Featured in the documentary “Art, Islam & Europe”. A short documentary by Khéridine Mabrouk – Produced by the British Council as part of its “Belief in dialogue” project. August 2011. – Featured in the book “Graphic: inside the sketchbooks of the world’s great graphic designers.” June 2011. – Featured in Al-Bayan Newspaper, Dubai, United Arab Emirates. November 2010. – Featured in MainGate Magazine, Beirut, Lebanon, 2010. – Octane Magazine, Malaysia. August 2009. – Vientiane Times, Laos. August 21 2009. – Assafir newspaper, Lebanon. October 11 2008. Interview. – Mondanité Magazine June 2008. Lebanon. – Canvas Magazine, Dubai, UAE. May / June issue 2008. Above: Tarek Atrissi’s interview on MBC’s “Good Morning Arabia” TV show. Dubai, United Arab Emirates, 2012. – Featured in Arabesque: Graphic Design from the Arab World and Persia, 2008. – Tegenlicht, VPRO TV, The Netherlands. Featured & Interviewed in the Documentary: the Rising Gulf, 2008. – VOX Design Magazine, Poland, 2007. – Interview + work features in “The Designer as Entrepreneur”, a book by Steven Heller and Lita talarico, 2007. – Featured in Worldwide Identity Book, Published by Rockport & Icograda, 2005. 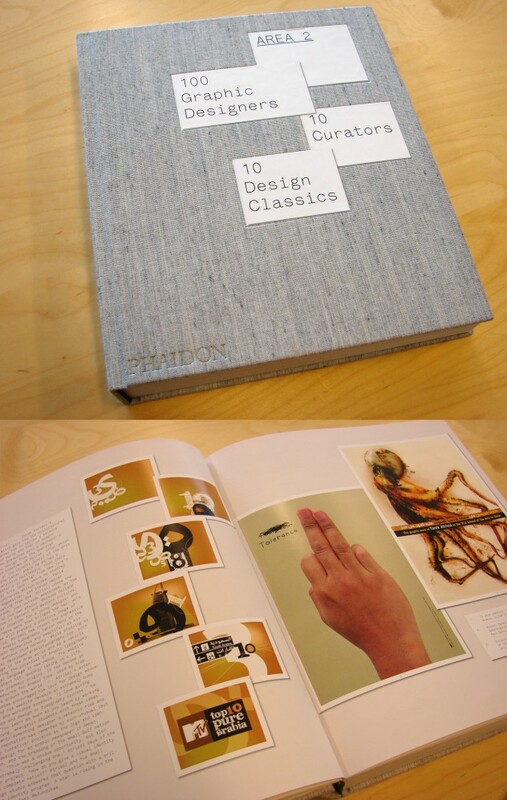 Above: Tarek Atrissi’s work featured in Area 2, Published by Phaidon, showcasing the best 100 graphic designers of 2008. – Al-Hayat Newspaper, December 2004. – Spatium Magazine, Germany, issue 4, 2004. – Design Graphics magazine, Australia, 2004. – Outlook Magazine / AUB. October 2004. – ID magazine, USA, issue May 2004. – The Education of a typographer, Published by Allworth press, by Steven Heller, 2004. – Vecer newspaper, Slovenia, May 2004. – Kunstbeeld magazine, The Netherlands, issue 05/2004. – Novum magazine, Germany, issue 04, 2004. – The Peninsula Newspaper , Qatar, February 2004. – Al-Sharq newspaper, Qatar, February 2004. – UPS Age Magazine, India, Vol1 Issue 6, 2004. – Advertising Industry magazine, Russia, January 2004. – Output 06, Germany. Published by verlag Hermann Schmidt Maiz, 2004. – Adobe Partners by Design, Web review, 2004. – Gulf Marketing Review, United Arab Emirates, April 2004. – Identity Magazine, United Arab Emirates, April 2004. – The New York Times, USA, May 2004. – Taschen’s 1000 Favorite Website- Germany- Published by Taschen, 2003. – étape magazine, France, issue 93, 2003. – Annahar Newspaper, Lebanon, Dec 2003. – Step inside Design, USA, Vol 20 issue N1. 2003. – Spher magazine, USA, 2003. – Arab American Business, USA, Vol3 issue 5, 2003. – Marhaba magazine, Qatar, issue December 2003. – Addiyar newspaper, Lebanon, Dec 2003. – Step Inside Design, issue January 2003. – Annahar Newspaper, Lebanon, Apr 2003. – Gulf Times Newspaper , Qatar, April 2003. – Al-Watan Newspaper, Qatar, April 2003. – Al-Sharq Newspaper, Qatar, April 2003. – Better Web Design, Korea, 2002. – Novum magazine, Germany, Issue 12, 2002. – Create Online magazine, UK, issue 02, 2002. – Novum magazine, Germany, issue 05, 2002. – Arab Ad magazine, Lebanon, Vol.12 #1, 2002. – Items magazine, The Netherlands, Issue June 2002. – Annahar Newspaper, Lebanon, July 2002. – Annahar Newspaper, Lebanon, June 2002. – Agenda Culturelle, Lebanon, issue 124, 2000. Above: Tarek Atrissi Atrissi Design featured in various international Newspapers, magazines and books.